Four weeks among our people! 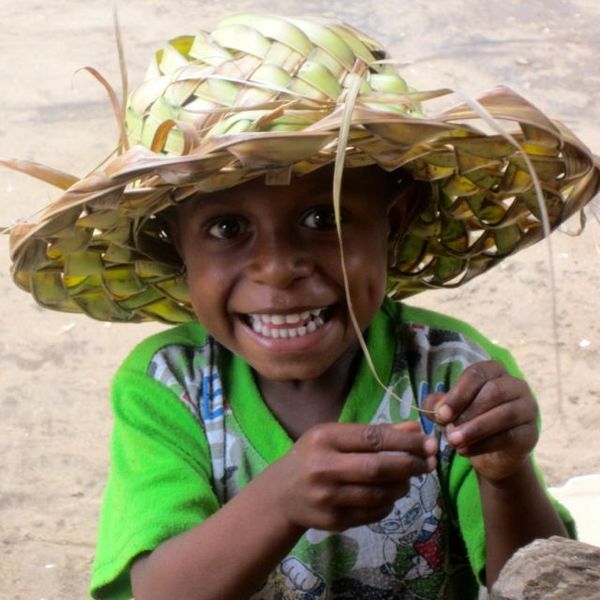 Yes, there are plenty of stories to tell from our recent four week trip among the Orokolo! The new pictures on the website will give you a great idea of the things we experienced! In days ahead, we will post stories on the website of interesting moments (like the 5 hour boat trip to the Baimuru lumber mill, the last two hours of travel being in pitch DARKNESS!) In this letter we will try to give you a few highlights from each week spent with the four national pastors in the Ihu area. We hope each church and family will become a part of your regular prayers! Our trip began with a short plane ride and a 1½ hour dingy trip. We spent the first week in Auma-Haruape with Pastor David and his wife, Mavina. Neither were raised in this place, so they do all their ministry in Pidgin instead of Orokolo, the local language. David received his training at the ABWE Baptist Bible College in Goroka PNG. They have 3 children, all attending school out of the area: grades 4, 9, and 11. Lorrain, their youngest, loves popcorn, and we did what we could to enhance her supply. I preached here 3 times on Sunday, led the Wednesday afternoon prayer meeting, and preached an outdoor evangelistic service in the village center Thursday night. David and Mavina were great hosts and gave us lots of opportunities to be involved in culture: building fires and cooking local foods, preparing sago, gathering materials and working on a leaf roof, and making a “blind”, the woven mat used for walls. Pastor Maisa learning The Strong’s Concordance! We boarded a dinghy Saturday morning for a 30 minute ride to Harevavo, met up with some folks from Shem Baptist who would be escorting us on the 2 hour walk to Huruta village, home of Liberty Baptist Church. Pastor Maisa, his wife Jennifer, and the church members were excited to see us – they had been anticipating our return since the December Bung! [We are still seeing fruit from that week! Poku, the man Jerry and I led to Christ is attending faithfully, and the week following the bung, a lady who visited the Sunday morning service when John Allen preached on John 3, came to Pastor Maisa to be saved!!] Pastor Maisa’s home is a busy place! He has 6 children staying there – 4 of his own, and 2 extended family members who are there to attend school. We shared a two-room house with the five boys, so let’s just say that “Blessed Quietness” was not the week’s theme song! I preached five times that week; Trina taught the ladies’ Wednesday morning meeting – and had some great individual fellowship with women in the church. Maisa has had no formal training, and I had a wonderful time showing him the great study tool a Strong’s Concordance can be! Trina did a lot of cooking and we all did a lot of eating this week! We are very familiar now with the many kinds of garden food available and the ways they are prepared. Plenty of coconut cream is used too! Who would think you could get fat in the jungle! 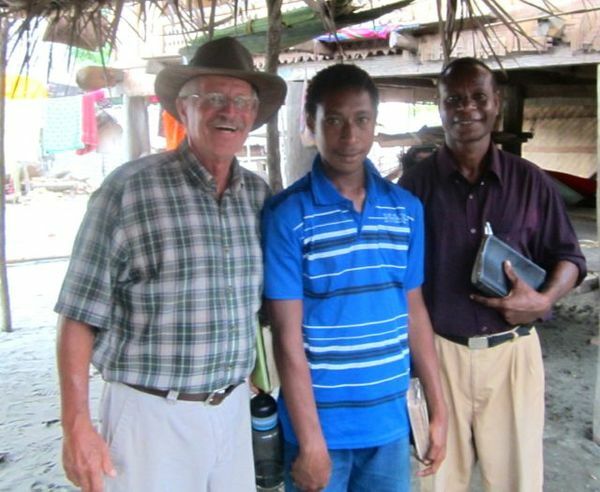 Pastor Maisa and I visited four neighboring villages. I was involved in clearing the land for a new church site, and working in the church garden. Our week ended with market preaching on Saturday morning, followed by Liberty Baptist folks walking with us back to Harevavo, where we would spend the next week. Ah! The seafood place! Shrimp, crab, and fish were a part of our regular meals this week, along with a few specialties like mangrove noodles, the worm that hangs out in the mangrove tree, cooked with sago. Harevavo is a beautiful village, situated along side a river and Orokolo Bay. The constant seabreeze cools the air and scatters the mosquitos! Shem Baptist Church was excited at our arrival. Murphy and his wife Lena have 4 children: a son in grade 7, and girls in grades 5, 3, and 1. We had a special time with them in family devotions, sharing a lesson that our whole family had written while our children were still homeschooling! Murphy also has had no Bible training and ended his own schooling at grade 7. He and Lena will both turn 36 this year, and both desire to be among my first students in the Bible School. I preached all day Sunday. We were blessed to see Kaiva, a 17 year old young man accept Christ after the morning service, and also the attendance of Lena’s backslidden father at the evening service, following a Sunday afternoon visit! Another visit to a younger man named Kori, also yielded fruit as he came to the Wednesday afternoon service and was reconciled with Pastor. 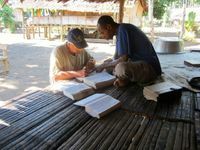 We spent our last week in Ihu Station with Pastor Jerry, Avoro, and 3 year old Lakobob. Pastor Jerry had come up short on lumber (no Home Depot there), so we men made a plan to travel to the Baimuru mill. We wanted to return with enough lumber for Jerry to finish the framing and get the roof on before the stormy April weather begins. Kiki, the man Jerry led to the Lord in December, has become Jerry’s carpenter! I left Trina with Avoro and headed off on what turned out to be quite an adventure! The Ihu Station church plant is off to a good start! The Sunday services have seen a high of 17 in attendance, and better yet, three Sundays ago, FIVE people were saved!!! Pastor Jerry and Avoro are doing an excellent job at getting known in their new community and finding opportunities to witness one on one. We are eager to be living there ourselves, getting involved more personally in this work, learning Orokolo, and beginning classes with Maisa, Murphy and their wives – and whomever else God has in mind! We are so blessed by you – your prayers, your giving, your burden for the lost, your commitment to seeing the world reached for Christ! The government surveyor has NOT yet come to place the cement posts at the corners of our Ihu land. He has scheduled April 2nd to do this. Please pray this commitment is fulfilled. A secure place to keep a dinghy and motor; we cannot purchase our own until this need is met. Safety and wisdom on a Muldoon supply run to Port Moresby March 27-29. Please click to download and print!